DAYTONA BEACH, Fla. (Nov. 16, 2018) – Brett Moffitt captured the NASCAR Camping World Truck Series’ biggest prize on Friday night, the culmination of a storybook season for the Iowa native and his single-truck race team. Moffitt, 26, completed an outstanding campaign for Hattori Racing Enterprises, winning the race and the championship following the Ford EcoBoost 200 at Homestead-Miami Speedway. The feat seemed unfathomable just a few months ago, when there was concern the operation wouldn’t be able to survive an entire season. But on Friday night, they were champions. With the victory, Moffitt outdueled fellow Championship 4 contenders Noah Gragson (third-place finish), Justin Haley (eighth) and Johnny Sauter (12th) at the South Florida track. Scoring a career-high six wins, Moffitt earned a spot in the Championship 4 following his first full-time truck series season. He punched his ticket to the Playoffs early, winning the second race of the season at Atlanta. From there he continued his winning ways with regular season victories at Iowa, Chicagoland and Michigan. Moffitt’s momentum continued in the Playoffs, where he captured a win at ISM Raceway securing the team’s Championship 4 spot. Moffitt finished this season with six wins, and career highs in both top fives (13) and top 10s (13). Moffitt’s No. 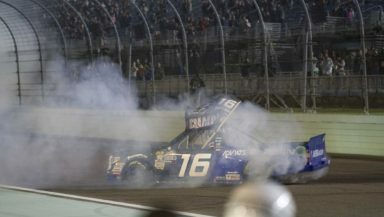 16 Toyota won the NASCAR Camping World Truck Series Owner Championship, the first title for Hattori Racing Enterprises in only its second full-time season. Last season, the team finished 11th in owner points with driver Ryan Truex. Myatt Snider captured the 2018 NASCAR Camping World Truck Series Sunoco Rookie of the Year. Driving for ThorSport Racing, Snider scored three top fives and eight top 10s. Chevrolet won its ninth Manufacturer Championship, and first since 2012, after a strong season that included 11 victories.